Milwaukee Tool is once again delivering unrivaled productivity to the professional trades with the introduction of the industry’s first interchangeable tank solution, the M18 SWITCH TANK Interchangeable Sprayer and Water Supply System. Core to the new system is the M18 SWITCH TANK Powered Base, which provides power to three different interchangeable tanks: a 4-Gallon Pesticide Sprayer, 4-Gallon Water Supply, and 4-Gallon Concrete Sprayer. 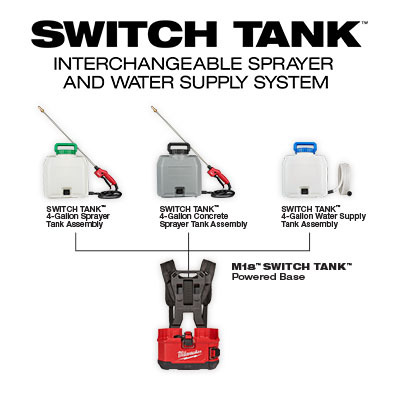 The M18 SWITCH TANK Interchangeable Sprayer and Water Supply System delivers instant, constant, and adjustable pressure with no manual pumping, and users can easily add on or replace any of the compatible tanks.